Since it was just Thanksgiving, and just to show how thankful I am for all of my blogger friends who have supported me in my pursuit of all things thrifty, I'm presenting my very first giveaway. The rules are very simple. Each day I will give you a clue to help get your creative juices flowing. The first person who leaves a comment with the correct answer will be the winner, but the prize will not be revealed until December 4. The prize is not a grand object, but something I found to be funny, and does provoke many memories from my childhood. Keep in mind that I won't be able to announce the winner until December 7. By the time you read this, I will be in Croatia, just having left Rome for a few days. But I didn't want you to think I had forgotten about you, since I never do, so let's start with Clue Number One. While in Fort Lauderdale, I visited Faith Farm Thrift Store, a crazy thrift-o-rama the likes I've never experienced. As soon as I walked inside the main building and went up the stairs, I experienced the thrift trance when I spied six cardboard boxes overflowing with party goods and other odd objects marked half-off. I dug through Christmas name cards, party horns and bundles of paper streamers until the mystery item appeared and took my breath away. I whisked it away with a huge roll if pink ribbon for a grand total of 75 cents. 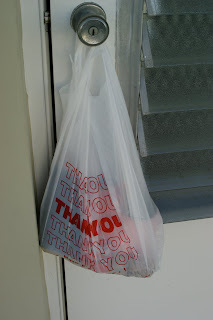 Oh, and it's right here, inside this plastic bag. And remember, on Monday, November 30th, my first ever mystery giveaway begins. I'll be giving clues all week long, reveal the prize on Friday, December 4, and finally announce the winner on December 7. I hope your Thanksgiving was a wonderful moment shared with family and friends! ET Note: Since I'm in Rome today as you are reading this post, I decided to bring back an old piece about a friend in Croatia (whom I'll see in a few days!) who is a master of reuse and repurpose. Oldies are still goodies, right? Just so you know that I'm still thinking of you this Thanksgiving while I'm away, my first giveaway starts on Monday, November 30. Nothing too grand, but a little something I found amusing in Fort Lauderdale, and I hope you will, too! 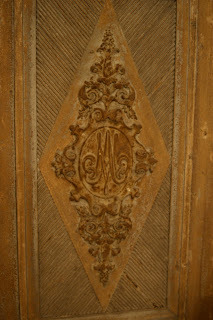 All my best to you and yours....and know how thankful I am for all your visits to The Elegant Thrifter. Even though I baked these goodies for a birthday party back in October, I would make the cake again for a festive, fall gathering like Thanksgiving. I found inspiration in the October issue of Southern Living where they made mini pumpkin cakes out of specially shaped tins, drizzled them with a rum glaze and then topped them off with leaves and tendrils fashioned out of pressed out caramel. Of course, everywhere I went was sold out of the pumpkin-shaped tins, so I bought two smaller bundt pans and used the same recipe to make a big pumpkin. It needed to cook about 20 minutes longer than the recipe suggests. But let me tell you, this pumpkin-y delight is so delicious and easy to make that I've already made it twice. And since I'm not one to leave well enough alone, I paired it with a plate of chocolate cupcakes with coordinating icing! I'd love to send you a sampling, but instead, why not start visiting me on Monday, November 30, when I start my very first mystery gift giveaway. I can assure that this silly little item I'm offering will travel much better than a slice of cake and I don't recommend that you attempt to eat it. 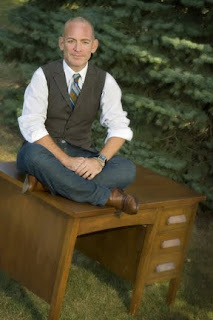 The other day while thrifting in Fort Lauderdale at the Faith Farm Thrift Store, I saw a desk that reminded me of the one that I've shared with you in my author photo that appears in The Find: The Housing Works Book of Decorating With Thrift Shop Treasures, Flea Market Objects, and Vintage Details. I'll show it again since after shaving the 'stache I now look like I did when I perched on the desk from my college thrifting years for the photo taken by Bob Greenspan in my sister's back yard. Be sure to visit visit my space next week for my very first giveaway. I'll start giving clues to the mystery gift on Monday, December 30. I will give you a tiny clue right now. It came from the same place I saw this desk, but I can assure you that it will fit cozily in your mailbox. A treasure can be almost anything that has a soul -- something that has lived a life full of memories and brings to the present its regal provenance or scintillating story. Or this glorified object might just be so inspiring in its presence that whatever history woven around it-- imagined or real -- is fulfilling solely for its charm and inspiration. That's the kind of object I stumbled upon when I met the enchanting Emilie-Marie who runs a jewel of a vintage and antiques shop in West Palm Beach Florida just down the road from Gardenhouse where we celebrated The Find: The Housing Works Book of Decorating With Thrift. You'll want to visit her, too, at her new blog emiliemarieliving.blogspot.com. destroyed on the fabled queen's demise, it's almost impossible to authenticate them as much as she has tried. While the signature details -- the intertwined initials and the flourishes that surround them, are spot-on for identifying them, no sketches of them exist, nor is there any historical data that places them 100 percent in the royal residence. 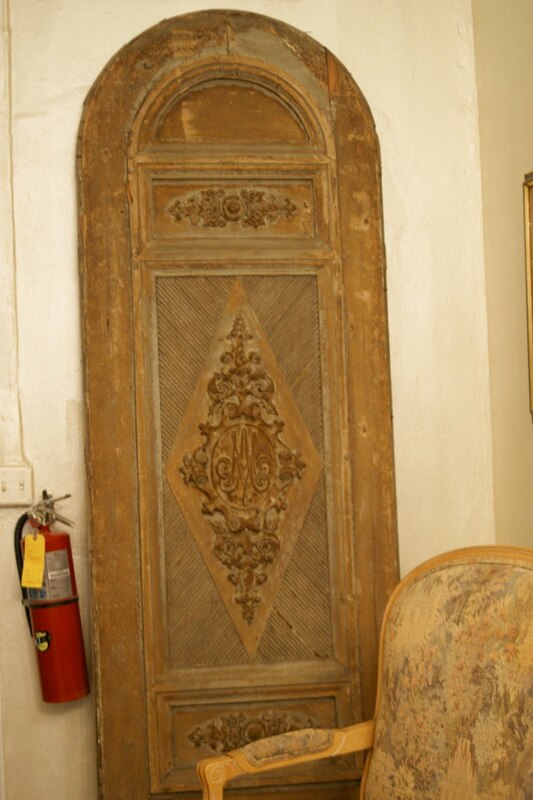 Whether they are actually Marie-Antoinette's doors is up in the air, but she has been able to date them back to the same era as the queen, and either way they conjure up dreamy imagery of the royal court of Versailles. Marie still has two of the doors from her original discovery and at times has advertised them for sale, but she really doesn't seem to want to part with them, and nor would I! Get ready for my first giveaway that starts next Monday, November 30. I'll give you hints each day as to the thrifty item I procured. It's far from anything as grand as these doors, but it conjured up so many funny memories of my childhood that I had to have it....maybe just for you! I tossed an 50-cent Euro coin (that's just more than $1!) into the Trevi Fountain in Rome last night, hoping that the low dollar exchange rate will bring me -- and you -- much luck in the coming week! (Mostly)Always Frugal (in the U.S. and not used to tossing more than a dollar into the water), Always Fabulous! The Gift of Thrift: Hellooooo Valerie! If you'd like a Hooch Bag for a gift or special occasion, visit me over at The Hooch Bag! 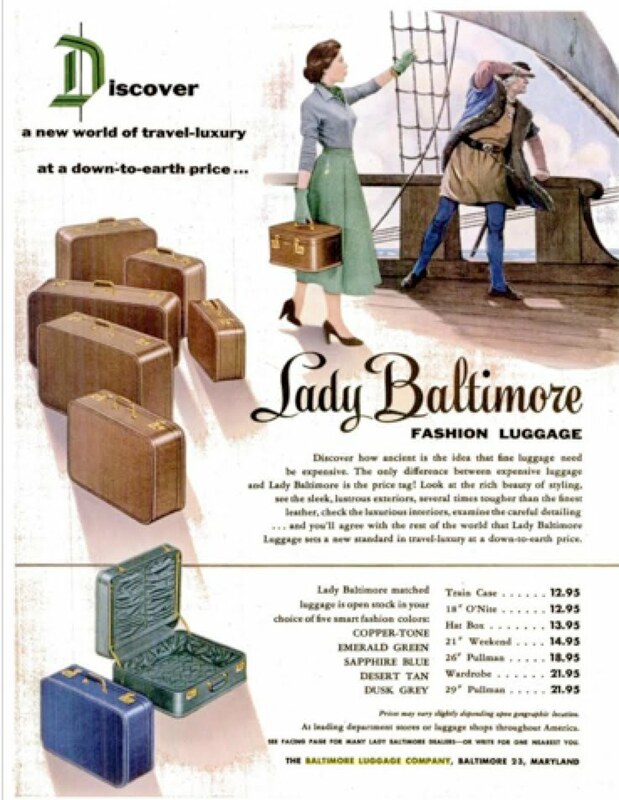 Since I leave tomorrow on a trip to Europe, I'm especially attracted to anything that makes me think of the glamorous day of travel, such as this 1954 ad for Lady Baltimore luggage. No, we won't be sailing the high seas on this voyage to arrive half-way around the world. Instead, we're heading over to Rome and then Croatia on a Lufthansa Airbus, which always has me wondering.....how much and how to pack. Now if it were the good old days of travel when we weren't packed like sardines into a plane, I might have picked up this Lady Baltimore suitcase for sale on the street in the East Village for $5. Heck, for $1 more, I could have taken the whole library of books for a little reading material in-flight. 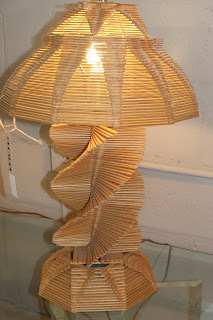 When I spied this lamp at Decades, a vintage consignment shop in Fort Lauderdale, I was reminded of being a kid and making all kinds of crafts out of Popsicle sticks. We would take colored yarn and weave it through the crossed sticks to make God's Eyes, or layer them on top of each other to craft little frame around a biblical scene. My friends laugh at me when I threaten to start a Vacation Bible School home accessories collection, filled with carved soap figurines, sand deserts in lidded, baby-food jars, terrariums in vinegar jugs or faux leather jars with shards of masking tape colored with shoe polish. Any backers for the VBS Collection? A few days ago when I posted a studly lamp created out of old car parts from WhisperWood Cottage, I was reminded by The Antiques Diva of a term that Simon Doonan, the fabulon behind the windows at Barneys New York, taught me: Mantique. He pulled out this term as we were shopping in Housing Works to find wild home accessories and come up with innovative -- and hilarious-- uses for them. After perusing the shop for fewer than five minutes, his eyes fixed on a pair of resin tusks mounted on a silver sand. He identified them as a mantique, something so dripping in testosterone that it should be treated with the utmost of respect. The Antiques Diva told me how her husband once took the grill from a 1930s Peugeot and turned it into wall art for his bathroom. I can only just imagine how that revved up the space. Why, there's even a shop in New York called Mantiques Modern dedicated to manly accessories, such as mounted guns and mechanical gears. 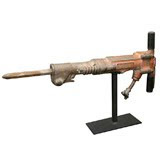 I especially like this Mid-century jackhammer turned home décor! "Even the most feminine of atmospheres needs at least one mantique," Simon says in The Find: The Housing Works Book of Decorating With Thrift Shop Treasures, Flea Market Objects, and Vintage Details, since too much estrogen for anyone is not a good thing, "but for a healthy balance, a mantique is de rigeur." Always Frugal, Always Fabulous... even though I shaved off my mantique! Even though we may have never met them face-to-face before, the familiar faces we collect on our thrift and vintage adventures quite often become family once we bring them into our homes and our lives. 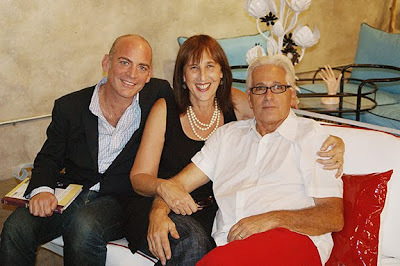 That's how I feel about Cheryl Maeder and Gary Antonio of Gardenhouse who gave a heartfelt welcome last week in West Palm Beach to The Find: The Housing Works Book of Decorating With Thrift Shop Treasures, Flea Market Objects and Flea Market Objects. Being that Cheryl and Gary are beloved members of the West Palm Beach community -- one that they joined just few years ago from San Francisco -- she easily enlisted delightful people to make this event one of the best The Find has encountered while on the road. Sharon McCormick-Keiley of the Community Redevelopment Agency and Paula Martin of the Historical Society of Palm Beach County came on board with Gardenhouse early on to create and promote the memorable event, which drew more than 100 fabulous people to the design destination. Local establishments, such as Café Centro, Jade Kitchen and Sunset Grill, donated catering so delicious that it was completely gone by evening-end. And if that weren't enough, Jennifer Bell of The Sugar Monkey, brought sweet confections so tasty that they disappeared as quickly as they were set out! I can't thank them enough for their generosity. Here I am trying out my clean-shaven face with my new friends Cheryl and Gary. Aren't they adorable? Just like the portraits that Cheryl so lovingly assembled in her home, I think we look like we've known each other forever, don't you? Saturday Surprise! A kinder cut? I decided to own up to my face and cut the 'stache. It wasn't without much trepidation, but when I started thinking about why I grew the brush above my lip, well, I think it was a bit of a disguise, maybe even a bit of a crutch or distraction, from who I really am, not to mention that it was looking like a gray bristle and looked nothing like my photo that appears in The Find: The Housing Works Book of Decorating With Thrift Shop Treasures, Flea Market Objects, and Vintage Details. I also wanted to start off with a clean look for heading down to West Palm Beach to celebrate The Find with the lovely photographer Cheryl Maeder Antonio and her husband Gary at their incredibly inspired shop Gardenhouse. I'll share more about this event that was sponsored by the Historical Society of Palm Beach County next week. And just in case I should get a tan down here, I didn't want a white blur above my lip! When I go to garage sales and thrift shops, I always have a short list of friends in mind in case I find the perfect gift for the appropriate occasion. Such was the case when I found these African butterfly wing art pieces at a garage sale last spring in Los Angeles with, or course, my best thrift shopping pal Ruth Handel. The woman who sold us these colorful specimen said her parents had acquired the pieces in Africa when they toured the country during the 1970s in their Volkswagon van! Made from wings found on the ground and not harvested from live butterflies, the pieces are very delicate and one was missing a few wings. Even so, how could I pass up these examples of intricate handwork with a price tag of $5? I found loose butterfly wings at The Evolution Store just down the block in SoHo, replaced the absent parts -- et voilà -- a gift suitable for my social butterfly of a fabulous friend, Bevy Smith! Reuse & Repurpose: Fresh Frozen Fun! Rummaging through all the goodies in Warrenton's Texas Antiques Week with The Vintage Laundress, LeAnn Stephenson, turned up so many goodies that my bags were stuffed full when I returned to New York. As you know, I love old cookbooks, so why wouldn't I also adore these old freezer boxes? They were completely unused, but a couple had been labeled to hold grated zucchini back in 1977. Oh, and they were about 25 cents! During Halloween, I took all these little boxes, filled them with candy and tied a bow on them as a party favor for a treat of fresh frozen fun! Tonight's the night to come to Gardenhouse Decor when it hosts The Find: The Housing Works Book of Decorating With Thrift Shop Treasures, Flea Market Objects, and Vintage Details. Special decorating guests featured in The Find Randall Beale of Beale-Lana will be there along with Carl & Co.'s Mark Ciolli. I always tell people that the streets of New York are a treasure trove of goodies that you'll never find in a store, and quite often, absolutely without a price tag. Just last week I walked by this trash heap, and as you can see, it's anything but garbage. If the velvet wing chair wasn't enough, right next to it was this mid-century vanity, complete with a beveled mirror in perfect condition sitting right next to it. 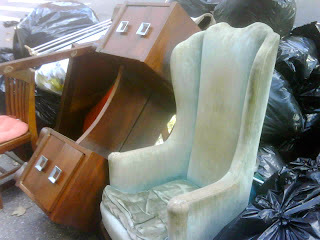 I had no way of hauling this stuff home, and if I did, well, I can't imagine where I would have put it. Instead, I snapped this picture with my BlackBerry and crossed my fingers that someone with good thrift karma, and a van, would soon pass by. Get ready for tomorrow on West Palm Beach and RSVP to Gardenhouse Decor when it hosts The Find: The Housing Works Book of Decorating With Thrift Shop Treasures, Flea Market Objects, and Vintage Details. Special decorating guests featured in The Find Randall Beale of Beale-Lana will be there along with Carl & Co.'s Mark Ciolli. 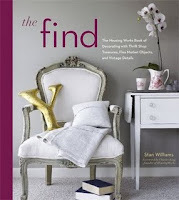 There's been yet another round of amazing press for The Find: The Housing Works Book of Decorating With Thrift Shop Treasures, Flea Market Objects, and Vintage Details thanks to Elaine Markoutsas' Primary Color column that appears all over the country, including the Kansas City Star. Also, The Palm Beach Post has listed Gardenhouse Decor's event for The Find as a must-attend for this week. See the announcement here. As I've said before, if you have a copy of The Find, and would like me to personalize it for you, just send me your mailing address at theelegantthrifter@gmail.com and inscription instructions and I will happily send you a bookplate to put in your book. Remember to RSVP to Gardenhouse Decor when it hosts The Find: The Housing Works Book of Decorating With Thrift Shop Treasures, Flea Market Objects, and Vintage Details. Special decorating guests featured in The Find Randall Beale of Beale-Lana will be there along with Carl & Co.'s Mark Ciolli. It's usually around this time of year that I take a trip to Paris to revive my inner Francophile and wander the streets of my favorite city in the world. I never over plan this trip but go where my heart takes me, be it an art gallery in the heart of the Marais, the sunny Luxembourg gardens for a relaxing read , or even the cinema for a series of French films on a misty, gray day. Unfortunately, I wasn't able to jet off to Paris this year, and was feeling a little blue the Sunday afternoon I spent recently at New York's Metropolitan Museum of Art. 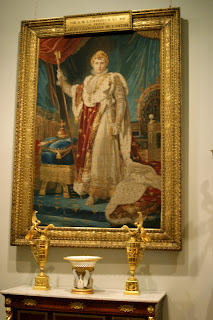 But my mood soon brightened when I noticed this tapestry created after a painting by François-Pascal-Simon Gérard of Napoléon I -- the same one I photographed last year when I visited Malmaison, the château that Napoléon Bonaparte built for his beloved Joséphine. As I gazed at the tapestry, I was reminded of the drizzly, gray day that my friend Catherine and I took the bus to the outskirts of Paris to linger in the rooms that are now a decorating inspiration, and have been restored with care to retain the sensation that the Emperor or his Empress might glide through at any time. This painting now hangs in a room called Le Salon de L'Empereur. Originally, the couple occupied a single room, but when Napoléon found it cumbersome to traverse the château to reach his library, he took over the two rooms so he could be closer to his work. Now isn't that just like an emperor? I won't see you in Paris this year, but come see me in sunny West Palm Beach instead! Remember to RSVP to Gardenhouse Decor when its fabulous artist-in-residence Cheryl Maeder Antonio hosts The Find: The Housing Works Book of Decorating With Thrift Shop Treasures, Flea Market Objects, and Vintage Details. Special decorating guests featured in The Find Randall Beale of Beale-Lana will be there along with Carl & Co.'s Mark Ciolli. Check out the Notables listing in the Palm Beach Post here! Having lived in a New York City apartment for more than 20 years -- not the same one continuously, though -- I'm always amazed at the true treasures that you can find in the compactor room. Now I didn't find this little ceramic elephant planter, but Veli did. He somehow sneaked it into the apartment, gave it a thorough scrubbing, wrapped it up and gave it to me as a gift last week. In a small flower pot, he combined a cactus with an African violet, which by the way, bloomed on my birthday, proving that some of the best gifts are absolutely free -- or can even be found in the rubbish! 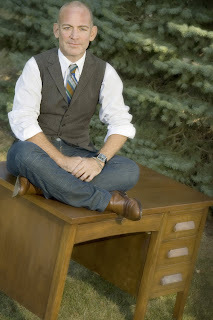 Reuse & Repurpose: Start Your Engines! 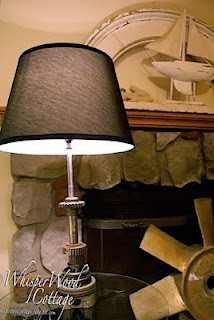 While perusing Whisper Wood Cottage the other day, I saw this fabulous lamp made out of Chevrolet pistons and transmission gears. It's so elegant and architectural, and the natural patina helps its mechanical shapes blend easily into a traditional decor. It also complements the piece of an industrial fan that she has leisurely placed inside the fireplace. 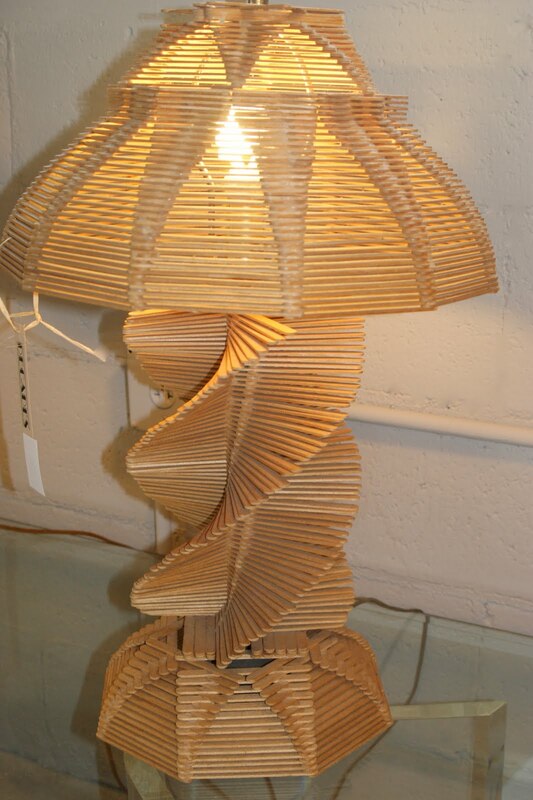 Now Amy at Whisper Wood credits her talented husband for coming up with this one-of-a-kind piece of portable lighting. See what happens when great creative minds get together! Fabulous & Frugal Fun: Watch Your Back! As much as we might complain about technology that chains us to our computers and BlackBerries, the camaraderie and friendship that's generated in Blog Land never ceases to amaze. It was via a friendly email that I met fine art photographer Cheryl Maedor Antonio who is also the proprietor of the amazing vintage design shop Gardenhouse. She had run across The Elegant Thrifter, and sent me a note to say hello. I immediately went to her Website and discovered her cheery and artistic hand cleverly adept at turning other people's cast-offs into fabulous design treasures. Of course, I find myself drawn to all the old metal furniture that she spruces up and gives new life, as well as her colorful take on repurposing old lighting. 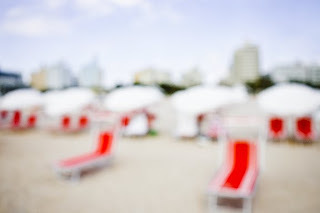 And then there's her art, which reminds me of impressionistic paintings of St. Tropez, even though they are her signature "Dreamscape" photographs taken on the Florida beach! Then one day I emailed Cheryl and asked her if she'd like to have a book signing for The Find: The Housing Works Book of Decorating With Thrift Shop Treasures, Flea Market Objects, and Vintage Details in her shop. And guess what, she said yes! Since then, we've had so many conversations -- both lighthearted and meaningful --that I feel like Cheryl is one of my oldest childhood friends....and we've never even met in person. So get ready for a festive get-together filled with tons of surprises and special guests in West Palm Beach! You'll adore Cheryl, her original art and her beautiful shop. And I'll have books on hand to sign especially for you. There is nothing I love more than perusing old cookbooks with baked goods that call for a stick of oleo or goodies made out of Cornflakes or Ritz Crackers. For the most part, I stay away from overly processed foods, but I do have a fondness for Rice Krispie Treats and Ro-Tel tomatoes and Velveeta cheese dip. And if there happens to be a Green Rice Casserole or a pan of Chicken and Rice set in front of me-- made with a can of cream of mushroom soup of course -- well I'm happy to dig in. While at Texas Antiques Week in Warrenton last month with LeAnn Stephenson, The Vintage Laundress, I found this wooden box of recipes that I couldn't resist. I think I paid 50 cents for this treasure trove of goodness packed with newspaper clippings and handwritten cards touting instructions for making everything from New England Hermits and Perfect Biscuits to Hilda's Peppermints and Skillet Chocolate Dumplings. Now why is it that any dish with the word skillet in it always sounds more delicious? Basically, this dish is a macaroni, canned tomatoes and ground beef concoction, easy to make, quite tasty and very filling. But after months of savoring this this thrifty culinary invention, one day it took a turn. from then on, it often contained mismatched noodles, odd vegetables such as green beans, or maybe even a few stray kernels of canned corn. As mealtime neared, my sister and I would ask, "Mom, what's for dinner?" "Ooooh, it's Busy Day Skillet," she'd respond brightly. Being a frugal and resourceful mom who always had dinner on the table even though she was a teacher during the day, her Busy Day Skillet was souped up with whatever might remain in the fridge -- extra spaghetti sauce, a Tupperware container of beef stew, maybe a few cooked potatoes or a even dash of rice. Basically it was leftovers wrapped in a cheery disguise -- a working mom's veritable Busy Day Skillet!